Home » Berita » Kesenian » Community "Sego Umami" Stage Up "Blusukan in Kampung"
Community "Sego Umami" Stage Up "Blusukan in Kampung"
Yogyakarta (ANTARA News) - Community of actors performing arts "Sego Umami" trying to reach out and eliminate the bulkhead with the audience through performances blusukan or go to the villages and staged performances in the courtyard homes. "Performance art karaya not be on stage or in the buildings, the yard in a village, fields or fields that have been fused with the citizens can also be used as a performance arena," said one member of the Community "Sego Umami" Joseph cap Italics in Yogyakarta . According to him, performing arts, held in the courtyard house in a village, for example, even more closer with the audience, as well as by itself will involve the audience, although not recognized by the audience. "Taking a space without distance with the audience and even taking the story as a myth that living in a kampung or village and continue to use the Java language, is deliberately done so with such events that we belong lakonkan citizens or spectators who are not far from 'them'," he said. He said the actual performances in the village has long pioneered the Community "Sego Umami", like last year, when the stage in Hamlet Numpukan, Imogiri, a festive atmosphere because there is active participation of local residents. "It was never imagined, and we did not expect such a simple staging location, but by the local population changed like night market. Bakul child snacks, fried foods, noodles, pecel, meatballs, kebabs lard, wedang round and all the potential in the arena tumplek village fairground impromptu, "he said. 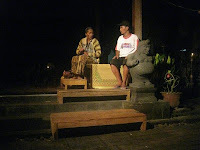 One of the instigators of the Community "Sego Umami" Elyandra Widharta claimed success with a variety of performances in the villages make this community given the nickname "Blusukan Theatre." "To further confirm this predicate, we will again hold a show in four villages. Performances first 9 April 2011 in the hamlet of Coral Goasari Beber, Displays Bantul, both 11 April 2011 at Studio Flowers Rice, Dobangsan, Wates, Kulon Progo, third 14 April 2011 in Hamlet Mangiran, Trimurti Srandakan, Fourth, April 17, 2011 in Hamlet Panggungharjo, Kweni, Sewon, Bantul, "he said. He said the story will go titled "Bleg-Bleg Thing", which tells of a village that is crowded with a variety of community residents in it has grown old myth about the delicate creature who by village residents was given the nickname Den Baguse Endro.